Michael Jacobs insists Wednesday night’s clash against Stoke takes an extra significance given Wigan Athletic’s blank weekend coming up. Latics don’t have a game on Saturday, with scheduled opponents Derby having FA Cup commitments, which could allow some of the teams below them in the division to crank up the pressure on Paul Cook’s men. 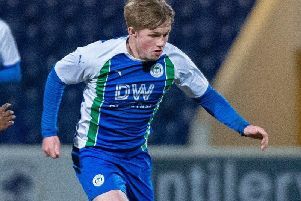 And Jacobs wants Latics to buy themselves some time with a positive performanbce – and result – against the struggling Potters at the DW Stadium. “The game’s even more important with us not having a game this weekend,” Jacobs told the Wigan Post. Latics have the chance to record a first ‘double’ of the campaign, having wiped the floor with the Potters during the opening month of the campaign. That 3-0 victory remains Wigan’s only away win this term but, with Nathan Jones having since replaced Gary Rowett in the Stoke hotseat, Jacobs isn’t reading too much into that result. “It was probably the best performance of the season when we beat them down there,” he acknowledged. “But it’ll be a completely different game on Wednesday, with a new manager coming in with a different style. “They brought in a few new players in January so we’re expecting a very tough game. “But our home form has been very good this year and it’s up to us to make that count on Wednesday. “When your home form is as good as ours, it gives you a real foundation to build your season on.